Three minutes…28 international judges…and cash prizes totaling $100,000. No, this is not the latest addition to this fall’s primetime game show line-up. It’s the CTV Canadian Documart, a pitching competition launched this year at the Banff Television Festival to provide three winning contestants with development money for their documentary projects. In front of a 400-member audience and a prestigious panel of international commissioning editors, seven nervous producers have 180 seconds to hook their fish and land one of the three big prizes: a check for $50,000, $30,000 or $20,000. The pitch works. Maudsley takes home the top prize, while Anne Pick’s view of the world through the luncheon loaf, SPAM: The Shelf Life and Times of the World’s Most Popular Luncheon Meat, takes third, as broadcasters agree that “there is much more to SPAM than ham in a can.” The prize for second place goes to a four-part series on the 20th century phenomenon of the teenager: Teen Invasion: How Teens Came to Dominate World Culture by Tom Perlmutter. Not making the cut were Sunday Night by Scott Harper, a Dilbertesque exploration of office life in the modern age; Inside the Great Magazines by Irene Angelico and Abbey Neidik, a look “behind the gloss” of the world’s great magazines like Vogue, Rolling Stone and Paris Match; and The River: An Inquiry into the Origins of AIDS by Arnie Gelbart and Yves Jeanneau. Modeled after the Australian Documart at the Australian International Documentary Conference, Canada’s primary commercial broadcaster introduced the event this year at Banff in an effort to stimulate the Canadian mainstream documentary market. 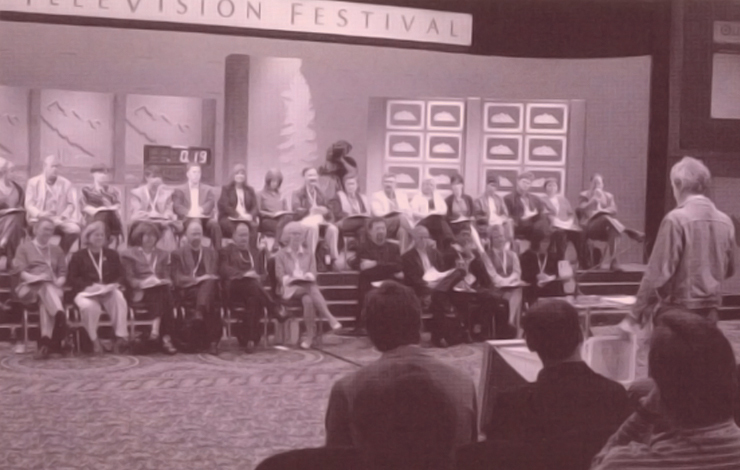 Though a far cry from the socially conscious fare of Canadian documentary tradition, the popular subject matter on sale in the ballroom at the elegant Banff Springs Hotel gave Canadian producers and their international partners a chance to catch a lucrative wave in the sea of fickle TV trends. Described by CTV president and CEO Trina McQueen as “a cross between Survivor, The Weakest Link, The Mole and maybe a step towards The Millionaire,” the competition taps into a trend of its own. Increasingly, international television markets are adopting game show-style pitching competitions that give producers and their ideas maximum exposure to the broadcasters present. While many documentary producers may be uncomfortable with the “humiliation tactics” employed, none can deny that a spot with the clock can lead to deals where the price is right. In the highly competitive arena of television production, access is key, and trying to get a place at the table with a commissioning editor at Banff can feel like trying to climb some of the resort’s surrounding rocky peaks with a bad hangover. With 2,000 delegates present this year, the pitching competitions were not only the place to be seen and heard by a roomful of the world’s top broadcasters, but also an opportunity to hear valuable feedback during the five-minute post-pitch Q&A period. For those in the audience, it was an opportunity to hear what broadcasters are looking for, as well as what works in a pitch—and what doesn’t. Although the process can be grueling, the results can be positive even for those who don’t take home top prize. Many producers talk about being approached post-pitch by broadcasters in the audience who received the idea more enthusiastically than those casting judgment on stage. Moreover, if a pitch falls flat, it may be temporarily embarrassing. But it may be also be an opportunity for the producer to see that a project needs further development. Whatever the approach, Banff remains not only one of the most beautiful parts of the world to visit, but one of the best places to break into the business, develop relationships and keep on top of the real game: making television that counts. Michelle Mason is an independent documentary producer from Vancouver, Canada. She is currently in production on The Friendship Village, a story about an international group of veterans who are building a village of reconciliation in Vietnam for children born with Agent Orange-related deformities.